Lausanne (SUI), 14 July 2015 – America’s Steffen Peters and Laura Graves today added individual gold and silver to the team title secured on Sunday at the Pan-American Games 2015 in Toronto, Canada where the host nation’s Chris von Martels scooped individual bronze this afternoon. The result is a sensational fifth consecutive Pan-American team victory for the Americans, bringing their tally to eight team and nine individual Dressage titles in the 64-year history of the event, and earning a team berth at the Rio 2016 Olympic Games. And it was a back-to-back double of individual gold for Peters who, although he didn’t surpass the Pan-American Games record score of 80.132 which he set at Guadalajara in Mexico four years ago with Weltino’s Magic, came close when posting 80.075 for today’s individual win with Legolas. The Americans took the lead from the outset of the team competition and held on for gold, but the host Canadians chased them all the way to the line to claim silver, while Brazil just pipped Mexico for the bronze. Results were combined from two days of mixed Small and Big Tour competition that began with Prix St George and Grand Prix last Saturday (11 July), and only teams with Grand Prix combinations were eligible for the single Olympic berth on offer so only USA, Canada, Mexico and Brazil were in that race. US stalwart, Steffen Peters, posted the biggest Grand Prix score of the day with Legolas at 77.240, and when added to Laura Graves’ 75.080 with Verdades, and Kimberly Herslow’s 75.184 in the Prix St George the first-day US tally was 230.504. Three scores from each team were taken into account, so Sabine Schut-Kery and Sanceo’s 71.790 in the Prix St George was the team discard. However, the Canadians were hot on their heels when Brittany Fraser and All In scored 76.105 and Chris Von Martels and Zilverstar posted 75.026. Of the Canadian Big Tour pairs it was Belinda Trussell and Anton who scored highest with 74.949, Megan Lane and Caravella awarded 72.400 for the discard. And going into Sunday’s decider Canada trailed the USA by just 4.433 points while the three-member Mexican side of Jesus Palacios (Wizard Banamex), Jose Padilla (Donnersberg) and Bernadette Pujals (Heslegaards Rolex) lay only 0.203 points ahead of Brazil’s Joao Paulo Dos Santos (Veleiro do Top), Sarah Waddell (Donelly 3), Joao Victor Marcari Oliva (Xama dos Pinhais) and Leandro Aparecido da Silva (D Caprio). There was plenty of pressure as the action got underway on Sunday in the Intermediaire 1 and FEI Grand Prix Special, but the Americans stood firm, bolstered by personal-best scores from both Graves in the Special and Herslow in the Intermediaire 1, and backed up by Peters‘ 72.667 while Schut-Kery posted 73.533. Their final tally of 460.506 moved them just over 5.5 points ahead of the Canadians to secure the gold at the end of the day, while the Brazilians leap-frogged the Mexicans for the bronze. Graves, whose meteoric rise to prominence only began in the lead-up to last summer’s Alltech FEI World Equestrian Games™ 2014 in Normandy where she sensationally finished tenth individually with Verdades, was delighted with her personal-best 77.177 in the Grand Prix Special. “He was amazing out there, really on again today!” she said of her horse. “He loves Toronto!” Graves and Verdades and Peters and Legolas were key players in the US team that lined up fourth in Normandy behind the three European powerhouses of Germany, Great Britain and The Netherlands who earned the three Olympic berths on offer there. Steffen Peters paid tribute to the silver medallists. “The Canadians did a wonderful job. They rode extremely well and gave us quite the run – it wasn’t easy!” he said. Canada’s Belinda Trussell, an Olympian and three-time competitor at the FEI World Equestrian Games™ who was lining out in her first Pan American Games said, after scoring 76.578 in the Grand Prix Special, “I think, for Canada, that this Games has pushed us to a new level. To be coming away (from the team event) with nothing below 70 per cent, and highlights of 76 per cent, has never been done. It’s really exciting for Canada. We are so pumped as a nation, and pumped to go forward to the next Games. We are international contenders – there is huge excitement!” she added. And the excitement continued today when a total of 21 horse-and-rider combinations lined out to contest the individual medals. Of these, 17 performed Intermediaire 1, while the final four Big Tour partnerships performed the Freestyle. With just six left to go, von Martels and Zilverstar rocketed to the top of the leaderboard with a percentage score of 79.500 for his Intermediaire test. Judge at M, Great Britain’s Stephen Clarke, awarded 81.500 and at judge at H, America’s Lilo Fore, awarded 80.750, and all five Ground Jury members put the Canadian temporarily into first place. The 32-year-old rider from Ontario held on to the advantage until overtaken by Peters and Legolas who posted the first, and only, over-80 per cent score when third-last into the arena. Fore, Clarke and Ground Jury President Elizabeth McMullan chose this pair for the no. 1 spot this time around, setting the new target at 80.075. And when, last to go, 27-year-old Graves and Verdades collected 79.825 they scooped silver and pinned von Martels and Zilverstar back to bronze. It was an extremely close-fought affair, with only 0.575 separating the three medal-winners. After Sunday’s Grand Prix Special, Peters admitted to having some issues in the execution of his test, but today he put all that behind him and came out once again with all guns blazing. “I’m still on cloud nine!” he said, shortly after the prizegiving. “On Sunday Legolas did a good job but I didn’t do my best riding job, so I wanted to prove today that Legolas deserves to be one of top horses in the world. I gave it every bit of my strength and he produced a wonderful clean test. And on top of that he allowed me to be within a tenth of a second to the music so we had high artistic scores,” he explained. And the 50-year-old rider was quick to refer back to his US team-mates and the success they have achieved over the last few days. “Let’s not forget that every single rider, including the fourth horse, contributed to the team gold medal. There was a combination of drop scores, so everyone did their job, and it is a fantastic group of people – all good-hearted athletes. It’s quite something to win with wonderful friends you almost have to call family!” he said. Victory in the team competition has secured a qualifying spot for the USA at the 2016 Olympic Games in Rio de Janeiro, Brazil. This was another record-breaking performance from the Americans who already held the record for four consecutive team victories, and have now increased that to five. 16 nations were represented in Dressage at the 17th Pan-American Games while 10 countries fielded teams. The Ground Jury consisted of: Hans Matthiesen DEN, Stephen Clarke GBR, Maribel Alonso MEX, Elizabeth McMullan CAN (President) and Lilo Fore USA. A total of 21 horse-and-rider combinations competed for the individual medals. The list of teams so far qualified in Dressage for the Rio 2016 Olympic Games now includes, Brazil (automatic qualification), Germany, Great Britain, The Netherlands (placings at Alltech FEI World Equestiran Games™ 2014 in Normandy), Australia (best ranked team from Olympic Group F or G at the Alltech FEI World Equestrian Games 2014 in Normandy), and USA (single qualifier from Pan-American Games 2015 in Toronto, Canada). Countries can also qualify “composite” teams. For full details of Olympic DRESSAGE qualification opportunities, and list of teams, check out this link: http://fei.org/system/files/Dressage%20-%20Rio%202016%20-%20Qualification%20System_13July%202015.pdf. The next major Olympic qualification opportunity is at the forthcoming FEI European Championships in Aachen, Germany, 11-23 August 2015, where 3 further places are on offer. History: Argentina staged the very first Pan American Games from 25 February to 9 March 1951 in its capital, Buenos Aires. A total of 22 countries took part, with four – Argentina, Brazil, Chile and Mexico – competing in the three equestrian events. Just three riders from Argentina and Chile lined out in the Dressage discipline, with Chile taking team gold as well as individual gold and bronze. Individual champion was Jose Larrain with Rappel. At this 17th Pan American Games 64 years later, Argentina finished fifth, behind Mexico, in the Dressage team event on a score of 201.016. Caledon, Ont. – The United States Dressage Team bids a fond farewell to the Pan American Games as they depart the Caledon Equestrian Park with Team Gold medals, an Individual Gold medal for Steffen Peters and Legolas 92, an Individual Silver medal for Laura Graves and Verdades, and a 2016 Olympic Games berth in Rio de Janeiro, Brazil. The week was marked by team success, invaluable experience, and ambitious optimism about the future. The final day of dressage competition saw 21 athlete-and-horse combinations performing their FEI Intermediaire I Freestyles for the Small Tour and FEI Grand Prix Freestyles for the Big Tour. Peters and Legolas 92 have the distinction of earning both Team and Individual Gold medals at these games. In addition, Peters won the Team and Individual Gold medals at the 2011 Pan American Games on Weltino’s Magic. FEI World Equestrian Games and FEI World Cup veterans, Peters and Legolas 92 are beacons of U.S. dressage achievement. The final combination to appear in Individual competition was the consistently successful team of Graves and her own Verdades. Always competitive in the best of company, they performed with characteristic accuracy and animation to achieve a score of 79.825% and earn the Individual Silver medal. The pair has had a career of ascending success including a fourth place team finish at the 2014 Alltech FEI World Equestrian Games and a fourth place individual finish at the 2015 FEI World Cup Finals. Canada’s Chis Von Martels and Zilverstar earned the Individual Bronze medal with a score of 79.500%. The FEI Bulletin released Monday night explains the series of events that lead to Sabine Schut-Kery and Sanceo not being permitted to compete in Individual competition. It is a great disappointment that a logical decision was agreed to by all parties and that subsequent and unnecessary actions were then taken by two countries. The USEF would like to express gratitude to Schut-Kery and Alice Womble, owner of Sanceo, who have been very understanding and gracious during this difficult process; they have been outstanding members of the U.S. Team. Caledon, Ont. – Excellent performances by all four members of the U.S. Pan American Dressage Team over two days at the 2015 Pan American Games resulted in a Team Gold medal win and direct qualification for the 2016 Olympic Games in Rio de Janeiro, Brazil. The team, composed of Sabine Schut-Kery and Alice Womble’s Sanceo and Kimberly Herslow and Kiroli Enterprises LLC’s Rosmarin in the Small Tour, and Laura Graves and her own Verdades and Steffen Peters and Four Winds Farm’s Legolas 92 in the Big Tour, was focused and consistently excellent to end on an overall score of 460.506. Both Graves and Herslow marked personal best scores in the FEI Grand Prix Special and Intermediaire I tests, respectively. Canada took the Team Silver medal with a score of 454.938 and Brazil won Team Bronze on 414.895. Individual competition takes place on Tuesday with the FEI Intermediaire I Freestyle and the FEI Grand Prix Freestyle beginning at 11:00am ET. Chris von Martels riding Zilverstar. Photo © Cealy Tetley – www.tetleyphoto.com. 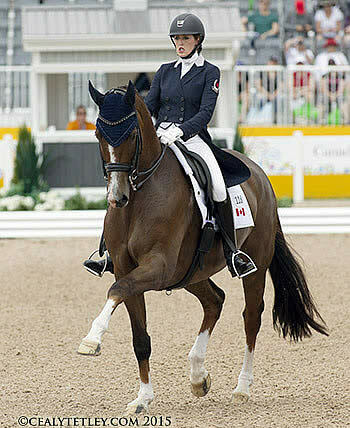 Caledon, Ontario – The Canadian Dressage Team comprised of Brittany Fraser of New Glasgow, NS, Megan Lane of Collingwood, ON, Belinda Trussell of Stouffville, ON, and Chris von Martels of Ridgetown, ON is currently sitting in second position following the first of two days of team competition at the TORONTO 2015 Pan American Games. 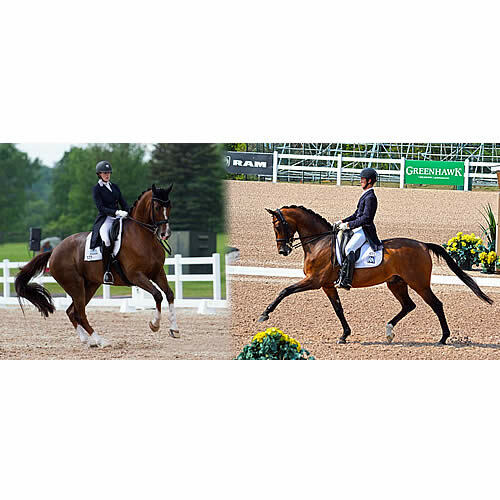 Dressage competition is taking place July 11, 12, and 14 at the OLG Caledon Pan Am Equestrian Park in Caledon, ON. The USA currently sits in first place with a score of 230.504 points, followed closely by Canada in second position with 226.071 points. With 206.703 points, Mexico has edged ahead of Brazil, who scored 206.500 for fourth position. A total of ten countries are competing, with the best three scores from each team counting towards the team total. In his major games debut, von Martels, 32, was the first rider into the arena for Canada. Riding Zilverstar, an 11-year-old bay Dutch Warmblood gelding sired by Rosseau, von Martels displayed a clean and expressive test to earn a score of 75.026% from the five-member judging panel. Fraser, 26, was next in for Canada riding All In, a ten-year-old liver chestnut Dutch Warmblood gelding (Tango x Damiro) owned by the athlete and Marc-Andre Beaulieu. Fraser held nothing back, producing a powerful test highlighted by incredible trot work, to put her name at the top of the leaderboard with a score of 76.105%. By day’s end, the Nova Scotia native was in second place in the individual rankings. Brittany Fraser is currently ranked second individually with All In. While von Martels and Fraser rode the Prix St. Georges test, Lane and Trussell both contested the Grand Prix, which meant that a ‘bonus’ of 1.5 points was added to the team total for each athlete. Only teams comprised of Grand Prix competitors are eligible for 2016 Rio Olympic qualification, putting Argentina, Canada, Mexico and the USA in the running for the one and only Olympic qualifying spot available at the Pan American Games. As the host nation, Brazil is pre-qualified. In the Grand Prix, Lane, 24, rode Caravella, a 14-year-old bay Dutch Warmblood mare (Contango x Riverman) owned by the athlete and her mother, Cathy Lane. The pair produced a precise test to earn a score of 70.900%. Lane is based at Deer Ridge Equestrian in Loretto, ON, which is a ten minute drive from the OLG Caledon Pan Am Equestrian Park. Deer Ridge Equestrian also acted as the host for the Canadian Dressage Team Pan Am training camp. Riding in the anchor position was Canadian Olympian Belinda Trussell, who is also a three-time World Equestrian Games competitor. Her international experience paid off, earning a score of 73.440% riding Anton, a 15-year-old dark bay Sachsen-Anhaltiner gelding (Antaeus x Melit) owned by Robyn Eames and Marc Trussell. When Trussell’s score was posted, it became apparent that the race for team gold is far from over. Team competition continues on Sunday, July 12, with both team medals and the all-important Olympic qualification hanging in the balance. Fraser and von Martels will perform the Intermediaire I test, while Lane and Trussell will contest the Grand Prix Special. On Tuesday, July 14, individual medals will be decided by the popular freestyle to music competition. Currently, Steffen Peters of the United States leads the way with a score of 77.240% earned riding Legolas 92 with Canada’s own Fraser hot on his heels with 76.105%. American Kimberly Herslow sits third with a score of 75.184% riding Rosmarin. Laura Graves of the United States is fourth with Verdades on 75.080% while von Martels is currently ranked fifth, followed by Trussell in sixth. Lane currently holds the eighth position, putting all four Canadian Dressage Team members in the top eight individually. The stakes are high as the team of Laura Graves, Steffen Peters, Kimberly Herslow, and Sabine Schut-Kery aim to qualify the U.S. for the 2016 Olympic Games. Direct qualification will be secured by earning the Pan American Games Team Gold medal. Graves, of Plymouth, Fla., will ride down center line on her own Verdades, a 13-year-old KWPN gelding. Graves and Verdades made their international debut last year and were on the U.S. Team at the 2014 Alltech FEI World Equestrian Games, where they earned fifth place in the Grand Prix Freestyle and helped the U.S. Team to a fourth-place finish. In 2015, Graves and Verdades had another spectacular finish on the world stage, taking fourth place individually at the Reem Acra FEI World Cup Dressage Final in Las Vegas. Peters, of San Diego, Calif., will partner with Four Winds Farm’s 13-year-old Westphalian gelding Legolas 92. Peters is one of the most successful dressage athletes ever to represent the U.S., having participated in three Olympic Games, three FEI World Equestrian Games, and four FEI World Cup Dressage Finals. At the 2011 Pan American Games in Guadalajara, Mexico, Peters rode Weltino’s Magic to Team and Individual Gold medals. Upon the retirement of his famed mount Ravel, Peters has continued his winning ways with Legolas 92. In 2014, the pair clinched their third consecutive The Dutta Corp./USEF Grand Prix Dressage National Championship title. In 2015, they performed beautifully at the Aachen CDI5* Grand Prix to finish in third place. Herslow, of Stockton, N.J., will ride Kiroli Enterprises LLC’s Rosmarin, a 10-year-old Hanoverian gelding. Competing in the Small Tour classes, the duo began the 2015 season in top form as they helped the U.S. Team to victory in the Stillpoint Farm FEI Nations Cup in Wellington, Fla. Competing in Europe for the first time this summer, Herslow piloted Rosmarin to wins in the Prix St. Georges and Intermediaire I at CDI4* Achleiten and CDI1* München-Riem. Also successful in Small Tour classes and competing as a member of the U.S. Pan American Dressage Team is Schut-Kery, of Thousand Oaks, Calif. Schut-Kery will pilot Alice Womble’s Sanceo, a nine-year-old Hanoverian stallion. Schut-Kery has competed Sanceo since his five-year-old year, forging a long and successful partnership. This year, the pair has had tremendous success on both U.S. coasts with wins in California and Florida. Extending their efforts to Europe, they were third in the Prix St. Georges and Intermediaire I at CDI4* Achleiten and second and third, respectively, in the Prix St. Georges and Intermediaire I at CDI1* München-Riem. Poised and focused, the U.S. Pan American Dressage Team will be a formidable competitor at the 2015 Pan American Games. Calgary, AB, Canada (July 7, 2015) – 2015 U.S. Pan American Games Show Jumping Team Traveling Reserve Todd Minikus continues to occupy the leader board before the 2015 Games in Toronto, delivering two trips to Spruce Meadows podiums this past week. At Spruce Meadows’ ‘North American’ CSI 5*, Minikus took home reserve in the $85,000 Enbridge Cup 1.50m on July 5th with Quality Group’s Quality Girl, and third with Two Swan Farm’s Babalou 41 in the $400,000 ATCO Power Queen Elizabeth II Cup. Less than a week before, the 2007 U.S. Pan American Games Team Gold Medalist had the victory lap against a field of 77, riding Plum Creek Hollow Farm’s Con Capilot to first-place in the $34,000 WestJet Cup of the ‘Canada One’ Tournament FEI series at Spruce Meadows in Calgary, Alberta, Canada. In the $85,000 Enbridge Cup, Minikus and twelve-year-old Oldenburg (Quidams Ruben x Dobrock) mare Quality Girl kept the heat on fellow American rider and two-time Olympic Gold medalist, McClain Ward, on HH Carlos Z, staying within less than a second of Ward’s 40.50-second winning effort and delivering the second-fastest (41.26 seconds) clean ride over Santiago Verala’s 1.50m course. Minikus also faced two-time U.S. Olympic Gold medalist and three-time Queen’s Cup champion Beezie Madden on July 4 in the Queen Elizabeth II Cup. Minikus finished third on ten-year-old Oldenburg mare Babalou 41, after Madden retired Cortes C and ceded to the 39.52-second effort by Ward and HH Azur in the jump-off. 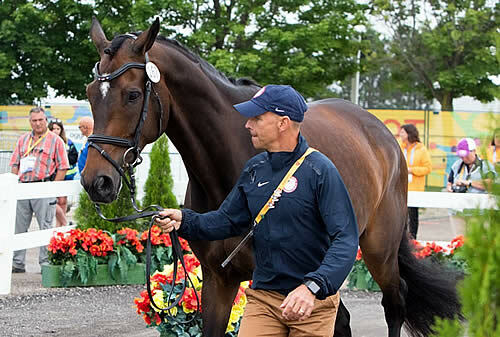 The Florida-based rider, with over 75 grand prix titles, has been amply successful in acclimating his Pan American Games Traveling Reserve partner, Babalou 41, to Canadian show soil leading up to Toronto. Earlier in June at Spruce Meadows, the pair were second in the $210,000 CP Grand Prix during the ‘Continental’ CSI 5* Tournament, and fourth in the $34,000 Duncan Ross Cup. The pair had a spectacular start to their season in March at Wellington, Florida, with double clears to anchor a U.S. squad to victory in the $100,000 Nations Cup and first-place in the $150,000 Winter Equestrian Festival 8 Lugano Diamonds Grand Prix. When not proving his and his horses’ talent in the show ring, Todd Minikus offers sales and training services just minutes from Wellington, Florida’s Winter Equestrian Festival (WEF) show grounds. Follow Team Minikus on Facebook or click www.toddminikus.com to ensure you don’t miss a minute of Minikus or the news that keeps the world jumping. Lausanne (SUI), 6 July 2015 – With definite entries now confirmed, a total of 44 horse-and-rider combinations from 16 nations will line out in Dressage when the equestrian action gets underway at the Pan-American Games 2015 in OLG Caledon Pan Am Equestrian Park in Toronto, Canada next Saturday, 11 July. The Pan-American Games are the world’s largest multi-sport event apart from the summer Olympic Games, and take place on a four-year cycle leading up to each summer Olympics. The Pan-Ams provide Olympic qualification opportunities for athletes in FEI geographical regions D and E – North America and Central/South America. Approximately 6,135 athletes from 41 nations will compete in 36 sports at this 17th edition of the event which runs from 10 to 26 July. And a record 45% of competitors are expected to be female, the most ever for any multi-sport event. The Games will also be the largest multi-sport event ever held in Canada, with double the number of athletes that competed in the 2010 Winter Olympics in Vancouver. The equestrian programme also includes Jumping and Eventing. The deadline for definite entries for these two disciplines is Monday 13 July. A total of 10 nations – Argentina, Brazil, Canada, Chile, Colombia, Costa Rica, Guatemala, Mexico, USA and Venezuela – will line out in the Dressage Team competition, but only four will be eligible for the single qualifying spot on offer for the Rio 2016 Olympic Games. With teams made up of a combination of Big Tour and Small Tour pairs, only Argentina, Canada, Mexico and the USA can make the cut directly, as they are armed with the required Grand Prix-level partnerships. However, apart from the single team spot up for grabs, countries can also qualify if three strong individual performances provide them with the option of creating a “composite” team. The American record at the Pan-Americans has long been outstanding, and at the last edition staged in Guadalajara, Mexico in 2011 they returned a record-breaking fourth consecutive team victory and filled all three steps of the individual Dressage medal podium as well. They cruised confidently into pole position in the team event ahead of the silver medallists from Canada, while Colombia claimed the bronze. And Steffen Peters set a new Pan-American Games record when posting a mark of 80.132 with Weltino’s Magic in the team competition before claiming individual gold ahead of Heather Blitz with Paragon in silver and Marisa Festerling and Big Tyme in bronze. It was a thoroughly convincing performance at all levels, and anchorman Peters was the linchpin of the US side. He will fill that role once again this time around, partnering Legolas, the horse that gave the home fans so much to cheer about when the pair finished third in the Grand Prix at the Reem Acra FEI World Cup™ Dressage 2015 Final in Las Vegas, USA in April. The 2011 result brought the US tally to seven team and eight individual Dressage Pan-American titles, and there is little doubt that they are the ones to beat. Peters will be joined by Laura Graves (Verdades), Kimberly Herslow (Rosmarin) and Sabine Schut-Kery (Sanceo) in the bid to further improve the already-impressive US strike-rate. Canada sends out Brittany Fraser (All In), Megan Lane (Caravella), Beldina Trussell (Anton) and Chris Von Martels (Zilverstar), while Argentina will be represented by Cesar Lopardo Grana (Tyara), Micaela Mabragana (Granada), Maria Florencia Manfredi (Bandurria Kacero) and Maria Juliana Ugalde (Caquel Cautivo). The Mexican side consists of Jose Luis Padilla Moreno (Donnersberg), Jesus Enrique Palacios (Wizard Banamex), Bernadette Pujals (Heslegaards Rolex) and Mariana Quintana Rivero (Guapo). Meanwhile, the Brazilian team includes Joao Victor Marcari Oliva whose mother, Hortencia Marcari, is a sporting icon in her home country and Vice-President of the Brazilian Olympic Athletes Commission. The Basketball legend was a member of Brazil’s winning team at the 1994 FIBA World Championship before going on to clinch Olympic silver two years later in Atlanta, USA, so her son is following in a strong sporting tradition. Individuals from Bermuda, Dominican Republic, Ecuador, Honduras, Puerto Rico and Uruguay will also be taking to the stage as Dressage gets the 2015 equestrian events underway at 09.00 local time next Saturday morning. Find out more about the Pan-American Games 2015 here and check out the programme of events here, while results will be available here. The list of definite entries for Dressage can be found here. Lexington, Ky. – The United States Equestrian Federation (USEF) has named the ranked alternates for the U.S. Pan American Eventing Team for the 2015 Pan American Games. As the first ranked alternate, Brannigan and Cambalda will travel to Toronto with the U.S. Pan American Eventing Team as the Traveling Reserve. The U.S. Pan American Eventing Team includes: Phillip Dutton with Fernhill Cubalawn or Fernhill Fugitive, Lauren Kieffer with Meadowbrook’s Scarlett, Marilyn Little with RF Scandalous, and Boyd Martin with Pancho Villa. Diane Creech and Robbie W. Photo by SusanJStickle.com. Creech and Robbie W, a 12-year-old Oldenburg gelding by Rubin Royal, turned in a series of impressive performances at the Adequan Global Dressage Festival in Wellington, Florida over the winter. They scored as high as 73.368 percent in the Intermediaire I and helped the Canadian team win silver at the Stillpoint Farm Nations Cup CDIO3*.